What's the Purpose of a Marriage License? Between picking the flowers and attending your bridal shower, you have to squeeze in time for the not-as-fun aspect of planning a wedding and getting married. This includes acquiring a marriage license, a document issued by a governmental authority that allows two people to get married. Getting a marriage license only means that you're legally allowed to get married to your betrothed, not that you actually are married. To obtain a marriage license, the newlyweds-to-be need to pay a visit to the county clerk's office in the location in which they are getting married. They typically cost anywhere between $35 and $115. If you're having an out-of-state wedding, that might mean you have take a trip ahead of time to complete this task. A marriage license is only good for the state in which you obtained it, meaning you can't get a license in Texas for a wedding that's going to take place in Florida. However, you don't have to be a resident of that state—a U.S. citizen can procure a marriage license in any of the 50 states. However, double-check the details of how far in advance you can get the marriage license or if there's any waiting period, as those timing particular vary from state to state. A marriage license is valid for only a specific time period—perhaps as few at 30 days, though some states' licenses are valid for a full year. Some states allow you to obtain a marriage license the same day as your wedding; others have a waiting period of perhaps 72 hours or so. When going to get the marriage license, bring identification. 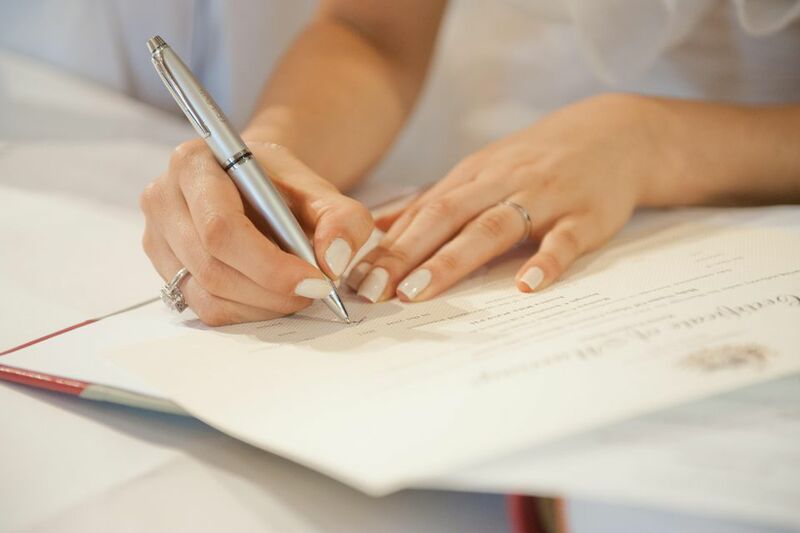 The requirements vary from locale to locale, but it's a good idea to have your birth certificate and driver's license on hand, as well as proof of divorce if you were previously married. A number of states used to require a blood test to obtain a marriage license; however, that's no longer the case in 49 states. In Montana, all women under age 50 must show proof of a Rubella blood test or a doctor's statement regarding sterilization. Alternatively, the bride and groom can read and sign a informed consent waiver, which bypasses the requirement. After a couple is married, the marriage license is signed by the bride and groom and their witnesses. Then, the officiant of their wedding files the marriage license with the local government authority that issued the license. With this registration process, the marriage becomes part of the public record. A marriage certificate is then issued and mailed to the newlyweds. The process typically takes a couple weeks. If either person plans to legally change their name. If one person is joining the health benefits that the other person's company offers. If either person requires immigration benefits. If you plan to apply for a loan for a house together.